Given the huge dependence on subsidy, can the trend of reducing solar tariffs be deemed as an achievement of the renewable or solar sector? Amplus Energy Solutions won projects across 10 states in the bids conducted by Solar Energy Corporation of India (SECI) for rooftop solar power. The tariff offered for projects in Uttarakhand, Himachal Pradesh, Puducherry and Chandigarh was the lowest in history—Rs 3 per unit of electricity. And in six other states tariff rates between Rs 5 and 6 per unit were offered. The bidding comes at a point where grid parity of renewable energy is being hailed as a turning point of electricity scenario in India. Grid parity is a situation when generating electricity from alternative sources of energy like renewables costs more or less the same as conventional sources. This means, renewable energy sources can generate electricity at the rate similar or equal to thermal power generation. Unfortunately, the Rs 3-per-unit-tariff is certainly not a step in that direction. The price can be achieved because the government is offering subsidies worth 70 per cent of the capital cost, ranging from Rs 38,500 to Rs 52,500 in the capital expenditure model. 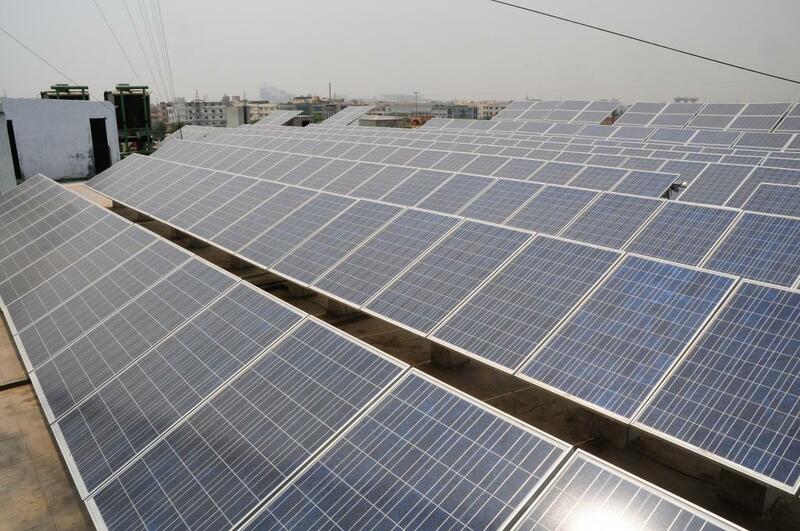 There is a direct infusion of subsidy for every kilo-watt (kW) in the rooftop solar sector. But even the solar sector in general has witnessed tariff rates fall to an all time low. This is because of reverse bidding rather aggressive reverse bidding in central and state solar project auctions (see Reducing solar tariffs in auctions in 2016) that has yielded tariff offer of around Rs 4.34 per unit in January by Fortum Finnsurya Energy, a Finland-based company operating out of Rajasthan. It was beaten less than a month ago by tenders worth 750 MW of solar at Bhadla Solar Park in Rajasthan which benchmarked by the tariff at Rs 3.93 per unit of power generation. Again, this low benchmark cost is for a 750 MW that would receive viability gap funding (VGF) of 30 per cent. VGF is capital subsidy to bridge the gap between the project cost dictated by the prevailing electricity rate and the price quoted by a developer. Can we really deem this achievement as grid parity when the achievement of low tariff is under the capital subsidy provided by the government when most of these projects have not seen a financial closure because banks do not consider these projects financially viable? Apart from capital subsidy for rooftop and VGF for larger solar projects, government offers a tax benefit called accelerated depreciation (AD) to all the projects that are not entitled to a direct capital subsidy. AD is the depreciation of fixed assets at a fast rate early in their useful lives. This AD is tax rebate that the project enjoys for the first few years of operation. This form of incentive is provided by the government to increase investment in any particular sector. One of the major reasons for the development of wind sector in India is AD. Seventy per cent of the 28,279.40 MW installed wind power is based on AD. The impact of AD was felt when the government discontinued the rebate in 2012 and the entire sector saw stagnation. By intense lobbying it was reintroduced for development of wind sector and now the capacity installed has bounced back (see Wind Capacity Installed). India has set a target to achieve 175 gigawatt (GW) renewable energy capacity by 2022. Out of this, 100 GW has been allocated to solar and 60 GW to wind. This ambition was raised in July 2015 when India announced its Intended Nationally Determined Contributions to United Nations in order to show the strides it is willing to make to reduce carbon emissions. To meet these targets and for development of and to attract investment in wind and solar sectors in India, there have been various forms of subsidies and tax incentives available. The question is with subsidies and other incentives involved, can the achievement of low tariffs be termed as achieving grid parity? Should India wait a little for the sector to be deemed competitive when thermal power produces cheaper electricity without the backing up of subsidies? When banks do not consider most of these projects economically viable to fund and they haven’t actually generated and supplied electricity at this rate, how can this be an achievement for the sector? However, India still has 237 million people who do not have access to electricity. We need to provide these people with reliable and affordable electricity as soon as possible. And if we have decided that renewable energy is the future of electricity, then we need to accept that today renewable energy is a little more expensive than thermal power without subsidies. We have to pay more for this clean energy and people with better paying capacity would have to share a bigger portion of this burden. It is great news that human finally wants to aim renewable energy! There are those 237million people in India without electricity! Well, we have innovated new solution to cut your solar investments up TO 30% with higher energy output !! If there are any interest of hearing more, please do contact !